Observe the speed suggesting stripes. Compare with other countries; f.e. Spain, Sicily, France, Pakistan. Norway brought the number down to the limit (one stroke, would that still work?). The number of boulders is also reduced to the absolute minimum. Only Belgium has an old sign with only two rocks. Learn more about the Boulder statistics. The number of rocks falling is less than the number already down. The reverse is true on all other signs in the collection. Check that out. 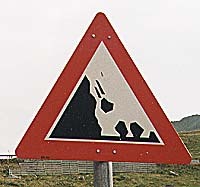 We have a sign from Iceland with an almost identical design. The three boulders have exactly the same shape but the speed-strokes are replaced with a fourth boulder.